I love the paisley. 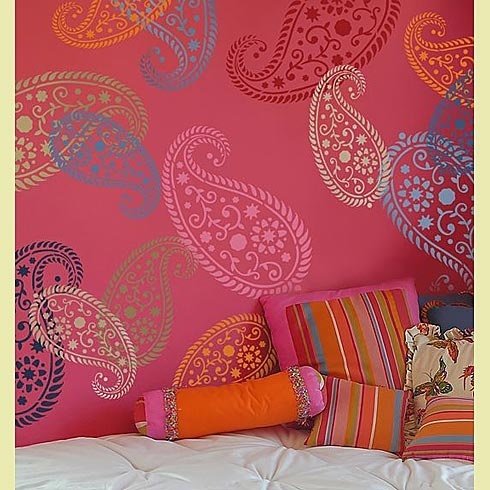 Paisley is the English term what we call "butehi or ambi" in India. It resembles a rain drop actually more like a mango. I like to have them on my clothes,curtains, bedspreads, table linen, bags...well practically everywhere. One of these days I going to share my paisley love with all of you. But I don't have them on my wall. I love them both. One so understated and one bright and loud.Swoon. I am more of let's go safe with white on the walls and let the artwork, cushions, trinkets, et al add color to my room type of person. Also I get bored easily so I like to constantly rotate things around the home. And committing my wall to any colour other than white stresses me out. What about you? Do you like to splash your walls with bold colours or like me you are the "let's go safe with white" types? OMG! The second one is totally me screaming all the way! Love it! Now if I can lay my hands and get the wall painted and the paisleys in tow, I think one of my dreams would come true! Amazing wall color pics with exciting designs.You look just fabulous in capturing images and creating new ideas. There was a time when I had paisley everywhere. On my scarves, Indian wear, bedspreads. Then came a day when I got too bored, and never found the love for it again. The wall looks great IMO. Understated and elegant. Lakshmi : I love all of your photographs...colour or no colour. Love, Big Fan. Simran:Totally agree, tough call. So many colours so many walls :) Good luck with decision making.